Analysis of water residue in Martian ice caps indicates that the Red Planet was once – at least partly – blue. Billions of years ago, Mars had a body of water that held more water than Earth’s Arctic Ocean, according to a NASA study published Thursday. “Our study provides a solid estimate of how much water Mars once had, by determining how much later was lost to space,”said Geronimo Villanueva, a scientist at NASA’s Goddard Space Flight Center and lead author of the paper. The study, published in Science magazine, is a result of observations and computations based on data from three telescope facilities on Earth, the instruments of which were able to distinguish the chemical signatures of two different types of water in the remnants of Mars’ atmosphere. Much of the Martian ice is composed of “heavy” water, or molecules in which the regular hydrogen atoms have been replaced by an isotope known as deuterium. After analyzing the ratio of these molecules, scientists believe they have calculated the amount of water Mars once had based on known rates of water loss to space. 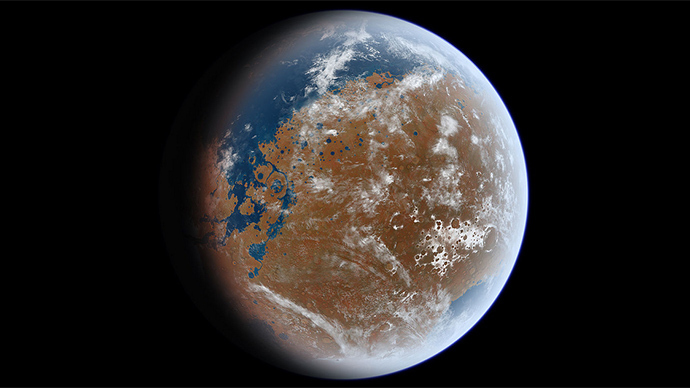 According to the study, only 13 percent of Mars’ original water remains in the ice caps. Scientists have estimated that 4.3 billion years ago, the planet had enough water for an ocean taking up 19 percent of its surface and reaching a depth of more than a mile (1.6 kilometers) in places. NASA videos released Thursday show the ocean covering much of Mars’ northern hemisphere. In terms of surface area, Mars' ocean was even larger than the Atlantic Ocean, which covers 17 percent of Earth's surface. NASA’s Curiosity probe has previously documented planetary features shaped by water flows and lakes. The existence of oceans on Mars suggests the planet may have been more hospitable to life than initially believed. “With Mars losing that much water, the planet was very likely wet for a longer period of time than was previously thought, suggesting it might have been habitable for longer,” said Michael Mumma, a senior scientist at Goddard and the second author of the paper. NASA currently has two robotic rovers operating on Mars, and three orbiting probes. The latest probe arrived in the Martian orbit in September 2014, on a mission to study the planet’s upper atmosphere. The agency is not planning any manned exploration missions until the 2030s at the earliest. Private explorers may reach Mars before that, however. Mars One, a Dutch nonprofit, has been selecting candidates for a four-person, one-way mission from a pool of over 200,000 applicants over the past two years, narrowing it down to 100 finalists recently. They hope to send an unmanned advance mission to Mars by 2018.